There are many different ways to manage reworks and track errors in Systemize. Here we're going to outline a process that has worked well for many fabricators. Fabricators often find it useful to set team goals related to a Rework report. When owners or managers make the results visible and reward the team for progress, they've been able to reduce errors and make more money! 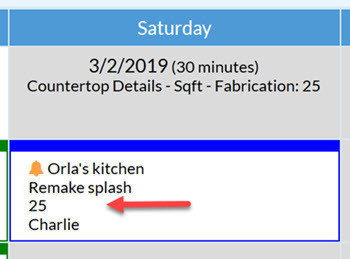 Create a Phase called "Rework kitchen" or "Rework splash". Add the Job Activities you'll need to fix the problem. 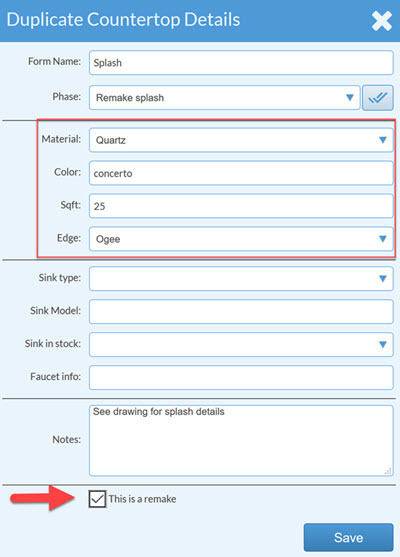 For example, if the splash broke in transit but was the correct size, then you don't need to Template again. You might just add Fabrication and Install. Schedule the Rework Phase Activities. 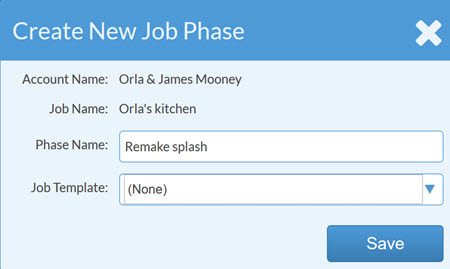 Add a new Area Detail Job Form (or whatever form you use to track the details about your jobs). Assign the form to the Remake Phase. Enter the square feet and other details you need for this remake. Check the box to indicate that this square footage is a Remake so you can filter out the number from your monthly reports. NOTE: If your Area Details form does not have a Remake checkbox, you can edit your forms to add one. 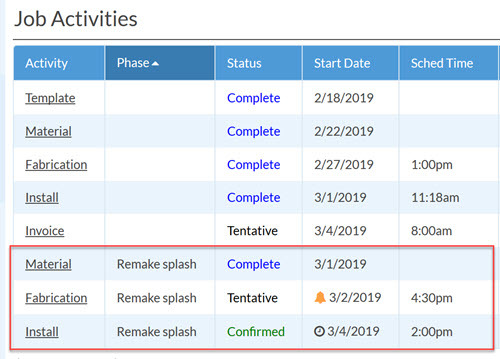 The activities for the Remake Splash can be displayed on your calendars with only the square feet for the remake (rather than the whole job). 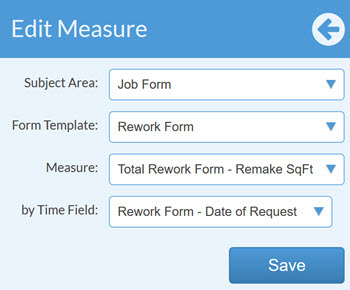 Create (or import this sample form ) an "Error-Tracking" or "Rework" Form that is used to record details about the error. 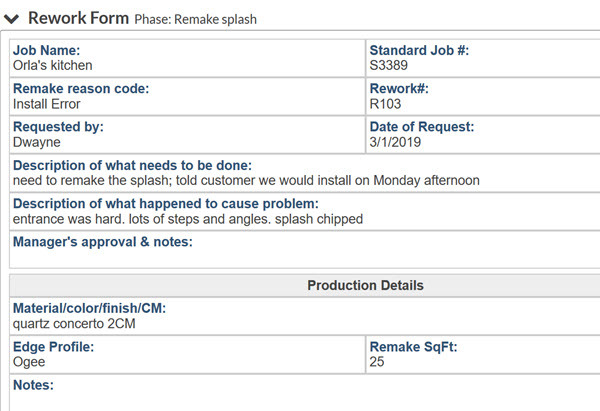 In this example, there are areas to record details about the problem, who was involved, who approved the rework, what material was involved, etc. When there's some kind of mistake on a Job, the appropriate person should add the Rework form to the Job and complete the initial details. 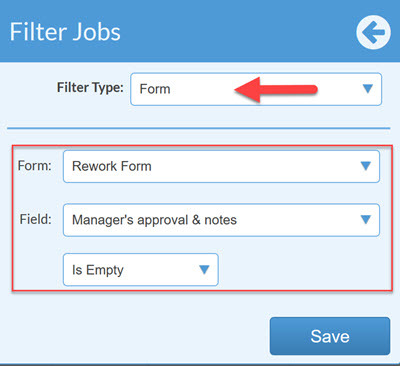 If the form requires approvals from different people within the company, you'll want to create a Job View or Report for those people to see that approval is needed. 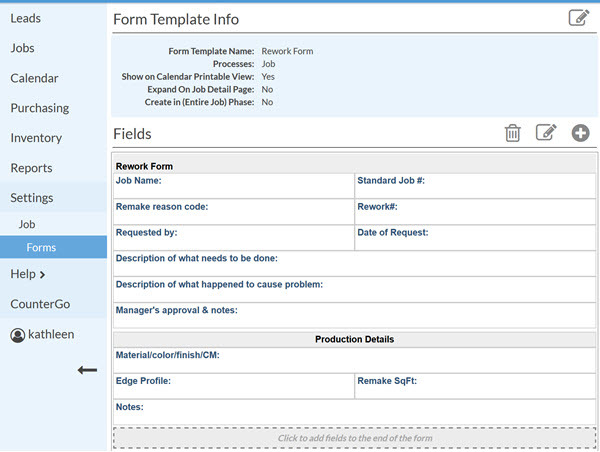 Create a Report to show you Jobs with the Rework form attached. If you create a Report with the essential information from your Rework form selected as your Display Fields, you can easily export the Report into Excel for further analysis.